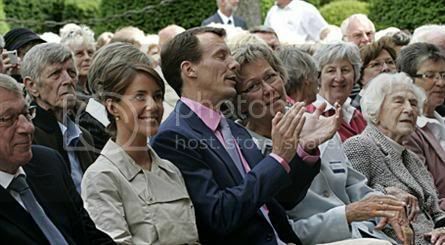 On Sunday Prince Joachim and Princess Marie allowed the Schackenborg forecourt in Møgeltønder to be turned into a stage for a royal concert with Southern Jutland's Symphony Orchestra, of which Prince Joachim is the patron. The large audience of 500 and the royal guests were entertained by the actors Preben Kristensen and Tomas Ambt Kofod and the opera singers Susanne Elmark and Gert Henning-Jensen. Sønderjyllands Symfoniorkester (the orchestra's name in Danish) was conducted by Peter Ettrup Larsen. The 5 Gaarde is becoming a solid little business for Prince Joachim and the other landowners [in the 5 estate business enterprise]. This year's result has almost doubled. Prince Joachim shows talent as a dynamic business man. Together with the other co-owners of the trading company 5 Gaarde Prins Joachim has almost doubled the year's result for 2007 from 475,000 DKK to just under 800,000 DKK... The 5 Gaarde was started into 2001, with potatoes from Schackenborg and greens from Frijsenborg. Since then the range of goods are expanding all the time with lambs and chickens from Frijsenborg, cheese and ox salami from Gyllingnæs, as well as bread and flour and bread mixtures in the 5 Gaarde brand. And the latest 5 Gaarde product is beer. The beer is produced at Harboe Bryggerierne with grain from the farms, and that is sold in Coop Denmark's shops as well as at selected hotels and restaurants. According to the annual report, it is a big part of the surplus now earned from supplying new suppliers. The company's management expects that the present products and range will be sold at Coop Denmark and they are working on other sales channels as well.